Lambswool fiber is soft, light and warm, which makes it a common choice for hats, socks and sweaters that need to be cozy and insulating but not too heavy. However, lambswool cannot be washed and dried like many other garments -- it shrinks and felts into boiled wool when an owner washes it incorrectly. Hand washing can be tricky, but by following a step-by-step hand washing process carefully, you can clean a lambswool garment safely at home. If your lambswool garments are labeled "dry clean," you can hand wash them at home. Fill a basin or sink with lukewarm water, about 79 to 97 degrees Fahrenheit. Make sure that the basin is big enough to hold the item with room to swish it around. Add the soap to the water and stir it around a little. Choose a soap with a neutral pH, like a gentle hand dishwashing detergent, shampoo or a cleanser specifically designed for washing wool. Push the garment completely under the surface of the water. Gently squeeze the garment, but don&rsquo;t agitate it. Soak the garment for about five minutes. Gather the garment in both hands, and lift it out of the water. Wool is weaker and heavier when wet, and you don&rsquo;t want to stretch a sleeve or other part out of shape. Press some water out of the garment. Be gentle. Dump or drain the soapy water, rinse out the soap, and fill the basin or sink with water again. Use the same temperature water as before. A change in water temperature may cause the garment to felt. 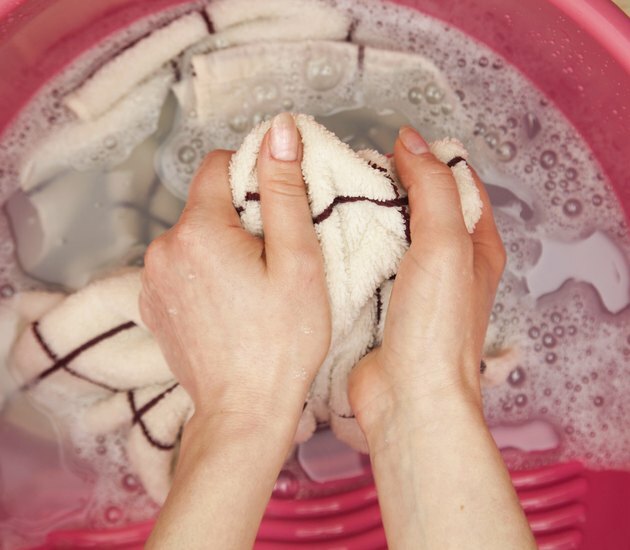 Add the garment to the rinse water, completely submerge it, and squeeze gently to remove the soap. Lift the garment out of the water and repeat the rinse steps again until no soap bubbles appear. Depending on the garment&#039;s bulk and the soap you used, you may have to rinse it three or four times. Spread the rinsed garment onto a clean towel and put another towel on top. Roll up the towels, and press gently on them to remove some of the water. Lay the garment out to dry on a flat surface. Make sure that all parts of the garment are supported to keep the wet wool from stretching.